The digital inclusion team at GDS recently published the digital inclusion scale. 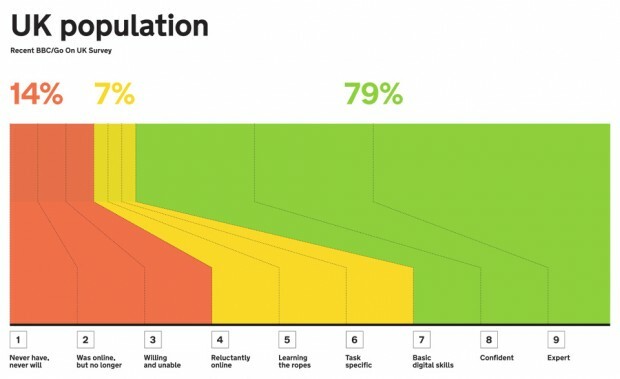 The scale shows that 14% of UK adults don’t use the internet - through lack of interest or lack of opportunity - and that 7% are just learning to use the internet or don't have basic online skills. As government services become digital by default we must design them to be accessible and work well for as many of these users as we can. That means including them in our user research. Including users with low digital skills in user research can be harder than you think. Template recruitment briefs for user research routinely ask for all participants to be "confident and experienced using the internet" and to "not reject the internet." People with low confidence often have better online skills than they think they do. Many recruitment briefs fail to compensate for this. Techniques like eye tracking or requiring participants to use a mouse can exclude potential users, such as the majority of older people who wear glasses and people with limited motor control. Many recruiters use recruitment methods that exclude people with low digital skills or limited internet access, such as social media advertising, online registration, online sign up for research events and complex instructions sent in emails and attachments. Also, the people we really want to reach often exclude themselves. Some are not interested in participating. Some believe we won't be interested in them: "you want to speak to Bob, he's the computer expert." Some are frightened of making mistakes and embarrassing themselves. So how do we reach people who have low digital skills and confidence? We run popup research at places where people who are digitally excluded or have low digital skills already go for advice and support. Places like libraries, day centres and education centres running literacy classes and beginner online sessions. These are familiar and safe spaces for most of the people there, so we get to see participants who would never sign up for lab-based research. We use paired research sessions. The pair is usually a user with low digital skills and a friend or relative they trust and often go to for help. Recruiting pairs like this can be easier than recruiting participants with low digital skills on their own. The pair can work together to manage the recruitment process and taking part together helps give them the confidence they need to sign up. It's also great to see how the pair interact in completing tasks and to learn how we can design services to help both of them. We're encouraging recruiters to improve their practices. We select recruiters based on their ability to recruit participants from all parts of the digital inclusion scale; we give specific feedback on the participants they recruit; we help recruiters build contacts with relevant organisations; and we review the questions they use to assess online skills and experience - we find that specific questions about sending emails or using mobile phone apps work better than general questions about using 'the internet'. A common flaw in user research is to focus too much on experienced users. Ignoring inexperienced users guarantees that their needs are not met. That's not a mistake we can make in designing government services. Working to meet the needs of the 21% who are currently not online, or do not have basic online skills, helps us remove barriers, improve interactions and refine our content. Making our services simpler, clearer and faster for everyone. Are there any more recent figures on the digital inclusion scale than August 2014?